I'm Emily Jackson, age 50-something or so, and I was born and raised in Russellville, Alabama, located in the Shoals area of northwestern Alabama. 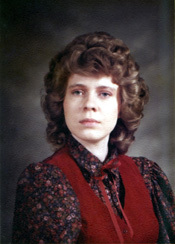 After graduating from Russellville High School, I attended the University of North Alabama in Florence and received a Bachelor of Arts degree in mathematics with a minor in German. My other interests (besides AYBS?) include needle crafts, 1960s music (particularly The Beatles and The Who), reading, an eclectic assortment of television shows (from Star Trek and Futurama to Who Wants to Be a Millionaire?) and (as you might imagine) worrying with my computer. Finally, I'd like to express my appreciation to every web surfer who's stumbled across my page and (hopefully) found it entertaining and/or enlightening. I'd also like to thank the many people who helped in one way or another to make the Virtual Video Vault possible...and I am unanimous in that!